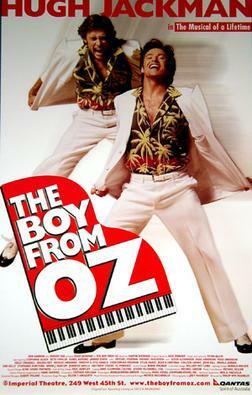 Famed Australian entertainer Peter Allen, who passed away in 1992 and had his life immortalised in a Tony-award winning musical The Boy from Oz (played by Hugh Jackman), has very little to do with Magic: the Gathering on first blush- or, for that matter, on any number of subsequent blushes. But of you were looking for a theme to describe the state of modern design you could well do worse than to lift a title from one of his best-known songs: Everything Old is New Again. Part of this is obvious- we are in the midst of Return to Ravnica, after all, and it doesn’t get any more straightforward than that. Recall, though, that this was a direction the game has only very recently attempted, first with 2010’s Scars of Mirrodin. To be fair, the concept was sort of ‘teased’ five years prior with Coldsnap, which was declared to be a “lost set” completing Ice Age block, but this was significantly different then an actual, full-block return to a previously-explored setting. Indeed, the concept of reusing old settings is only the most recent initiative Wizards has undertaken in the area of making the old new. A second area of the game that has seen reuse is in themes. This was seen most recently in last year’s block, Innistrad. As we discussed during the Innistrad reviews, the entire block essentially mined the same design space as a set ten years previous- Odyssey. Though there is little cosmetically to unite them, the concept of building a set around the graveyard shows a shared ‘genetic heritage’ that unites both sets. Certainly lingering feelings of inadequacy had haunted Wizards following Odyssey- for instance, precisely what the flavour tie between the set and the graveyard had never really been defined. Innistrad was a chance to reuse the theme and see if they could nail it the second time around- and if the tremendous success of the set is anything to go by, it would seem they did. The last area of reuse would be the first one to have seen print, which is mechanical. It may be a bit difficult to imagine now many years on, but there was a time at the dawn of the game and some years beyond where keyword mechanics were seen as single-use, to be employed in a block then permanently retired. Modern players are quite used to the return of popular, past mechanics- Innistrad brought back flashback, for instance, while Scars of Mirrodin had imprint, Zendikar kicker, and so on. 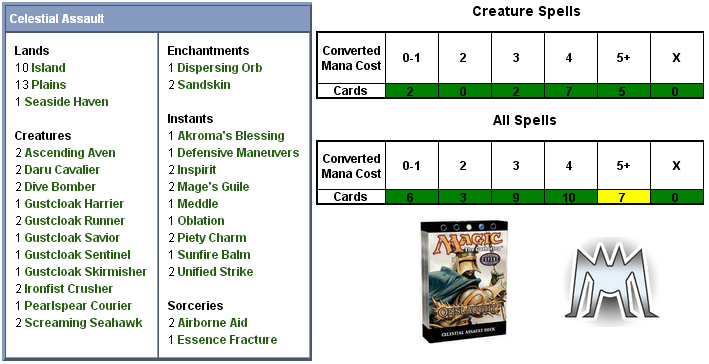 Meanwhile, the revamped Core Set philosophy following the first release (Magic 2010) has featured a single returning mechanic of its own, from scry (M11) to bloodthirst (M12) to exalted (M13). In short, R&D sees mechanics as a reusable resource that we can use to enhance the game. When the designers sit down to create a new set, we look at all the resources available to us. New ideas and old ideas are all paints they we can use to create our new canvas. If something from the past fits into what we are doing we will take the opportunity to use it. This doesn’t mean we won’t keep innovating… But at the same time, we are not shunning our past. During Magic’s first nine years, many great mechanics have been created. We would be fools not to revisit many of them (but not all – hey, not every idea’s a winner). And when we do bring back old mechanics, we will always explore new ways to play with them. We’ll find new twists and new interactions. Onslaught put a new spin on cycling in two ways. First, they changed the traditional cycling cost from the static to a much wider variety, including coloured mana. Second, they introduced cards that had effects that triggered when they were cycled. In many cases, you simply got a less-powerful version of the card’s standard ability, such as with Primal Boost. In other cases, the card could do something entirely different when cycled, such as with the classic Krosan Tusker– a card so versatile that it has found its way into a Duel Deck, Archenemy, and Commander. Although cycling wasn’t actually the first mechanic used across blocks (see: cumulative upkeep), it was the first time that the mechanic was part of the block’s mechanical identity, and set the stage for future blocks to dust off the relics of the past and merrily proclaim, hey, everything old is new again! That brings us to today’s deck, Celestial Assault, which makes generous use of cycling as well as Onslaught’s other primary mechanic, morph. Unlike preconstructed decks that tend to cluster around a certain mechanic, the tribal aspect of the set meant that the Theme Decks supported particular races, with the mechanical keywords sprinkled liberally throughout. Eventually, with 2008’s Morningtide, we would see the advent of the “tribal by class” concept, which separated what race a creature was (Goblin, Elf) from what it did (Soldier, Wizard). For Onslaught, however, they were one and the same, making Celestial Assault the Soldier deck. As you’d expect, that means a swarm of cheap creatures, combat tricks, and removal- and you’d be mostly right. But as you can see from the mana curve above, there’s little ‘cheap’ about Celestial Assault! Part of this is due to the new ‘Gustcloak’ mechanic. Although not considered a full-fledged mechanical innovation with its own keyword, a number of cards share the same ability. One of the problems with weenie decks is that they get outclassed fairly quickly. Your fast 2/2’s might bear down on your opponent’s early 1/1’s, but once they start dropping 3/3’s or higher, unless you have ways to clear the red zone (generally by either removing their beaters or making yours evasive), your window of opportunity for victory has all but closed. The Gustcloak mechanic overcomes this by making strength in numbers relevant, and by preserving your attackers from dying in combat. Whenever such a creature attacks and is blocked, you simply untap it and remove it from combat. Not only does it survive any potentially lethal blocks, but it’s now ready to serve on defense. It’s a useful ability that lets you be a fearless attacker, though in most cases it has an inflationary effect on the creature’s mana cost. The other factor that explains the deck’s high curve is evasion. As mentioned above, evasive abilities give your smaller creatures the ability to get in for damage more frequently, since they bypass any congestion on the ground in the red zone. Fully half of your creatures have flying, which also means that- forgive us- it can take a little time for your deck to get off the ground. The deck begins with a Gustcloak one-drop, the Gustcloak Runner. A simple 1/1, the Runner retains relevance throughout the game thanks to the self-preserving Gustcloak ability. Remember too that the deck holds true to its weenie/swarm heritage by layering in combat tricks, so your opponent might well regret blocking even this lowly fellow. Since there’s no cost to you for attacking, it’s essentially a neverending bluff. Quite unlike a weenie/swarm deck, Celestial Assault entirely abdicates itself of the two-drop slot, which is a generic Soldier deck’s most critical. Of course, it is important to note that environment- not archetype- is the biggest driver here, and in a slow environment you might find that the deck packed with three-drops is the fastest. Still, even that one extra mana makes a huge difference that isn’t always readily apparent. The value of two-drops in a fast deck isn’t that you have an automatic turn-2 play, but rather that you can double up and play two cards on your fourth mana drop, and work the numerical advantage angle. You can’t do that with three-drops until your sixth, and in Magic of course there’s no guarantee you’ll play a land a turn. Even once you arrive at your three-drops, there’s only a pair of them. The Gustcloak Harrier is the base 2/2 model, though like the Runner before it it is relatively on-curve thanks to also having flying. The other is the Pearlspear Courier, a 2/1 that’s easier to cast (thanks to only needing one White mana). The Courier is another in the line of pre-Equipment Equipment cards that sought to replicate a static boost bestowed by the card. 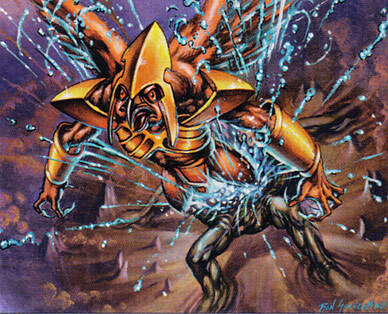 The earliest attempts at this were through artifacts like Ashnod’s Battle Gear and Endoskeleton, but Onslaught brought along a cycle of five creatures- one of each colour- that buffed their own tribes. With the Courier, any of your Soldiers can gain a +2/+2 bonus and vigilance, at the expense of keeping the Courier tapped. With all but two of your sixteen creatures Soldiers, you’ll seldom run out of targets. It’s at the hefty four-drop slot where the deck really begins to come alive. We begin with some additional Gustcloak options, the Skirmisher and the Sentinel. The Skirmisher is another aerial option- this time on a 2/3 body- while the Sentinel is a 3/3 without evasion. Next is the Dive Bomber, which acts as both a beater as well as removal. This makes the card a little awkward, since you’ll want to use every option you have on the attack, but being able to use the removal aspect of the Bomber means you have to keep it untapped until the right moment arrives. Still, having more options is always better than having less. Stayign in the air, we come to our next card, the Ascending Aven. A 3/2 with a common blocking restriction (Wizards refers to this informally as “high flying”), the Aven is one of two creatures in the deck that has morph- something we’ll go into some detail on shortly. Meanwhile, the final four-drop here is the Daru Cavalier. Modern players might have flashabacks to the Squadron Hawk when seeing the Cavalier, though of note is the fact that the Cavalier can only find one of its fellows. The deck only has two copies in it, meaning that the first time you pull off this trick in a game will almost certainly be the last time. This means it’s a classic case of diminishing returns. The first casting costs you four mana, gives you the 2/2 body with first strike, and puts you up a card. When you cast that second Cavalier, however, there’s no card to get, meaning you’re paying four mana and only getting a 2/2 body for it- much less appetizing. This actually gets even worse when we move up to the top of the curve, as the five-drop Screaming Seahawk offers you a virtually identical bargain. Also having only two copies here means that on that second summons, you’re paying five mana for your 2/2- not even flying makes that feel like a good deal. Still, it’s the price you pay for variance reduction, knowing you can get two creatures on the battlefield over two turns (if you choose). Now let’s go back and take another look at that Ascending Aven, the morph card. One of the most important aspects of the morph mechanic is its ability to conceal. In essence, it gives you the element of surprise over your opponent. That degree of surprise is only as varaible, however, as the component diversity of your deck. Put it this way- if you only have one copy of a single morph creature in your deck, your opponent is only going to be confounded by it until he or she figures out that’s all you’ve got. After that, if you play the morph they’ll know what it is and plan accordingly. Celestial Assault doubles that by adding a second morph creature, the Ironfist Crusher, which doesn’t do wonders for the element of surprise (hint: decks with a variety of morph cards are where it’s at if you’re running the mechanic). Now, we’re only plotting along a single axis here, which is number of different morph cards. To complicate matters a little, there’s a second axis to consider: what the morphs do. To give this a simple illustration, let’s use a hypothetical example. Let’s say you have a morph that is a 3/3 creature when you flip it, and another that’s a 4/4. That’s variety- your opponent won’t know until you unmorph it whether it’s a 3/3 or 4/4… but how much of a difference does that actually make? The cards are so similar that there’s very little contingency planning your opponent has to do, and will seldom go too far wrong by simply assuming it’s your 4/4 model. If, instead, you had one morph that turned into a 4/4, and another as a 1/1 Wizards that countered target spell when flipped, why now you’ve got that vital diversity! Your opponent has two significantly different contingencies to consider every time you play a morph: “could that creature get bigger?’ and “could my next spell get countered?” This second axis also builds in a great deal of intricacy, so you can see how a deck with a large number of morphs with a wide variety of effects can make that level of “unknown” grow exponentially for your opponent- that’s the element of mystery that Wizards was looking to capture when they designed the mechanic. Unfortunately for Celestial Assault, neither morph creature’s ability is particularly threatening. One of them (the Aven) simply grows a point of power, sprouts wings, and can’t block on the ground. The other (the Crusher) gets two more points of toughness and can block any number of creatures. They’re both useful to some extent, but by presenting such bland options in limited number it really only hints at what the mechanic is capable of. The final creature here is the deck’s first rare card, the Gustcloak Savior. A 3/4 flier for five mana, the Savior takes the Gustcloak mechanic and throws it on your entire army. At that point, you’re free to start sending in your entire side, knowing full well that all will be protected. Though instant-speed removal can set you up for a trap if your opponent blasts your Savior before declaring blockers, it’s a card that can really give the deck gas for that final push to victory. The robust noncreature support suite of Celestial Assault gives you a large number of options to support your ground troops, and it’s here that the Blue element to the deck really makes its presence felt with card drawing and targeting shenanigans. First up, however, is the removal package. Although somewhat abundant, there’s a wide variety of conditional effects making it a bit unreliable. The best of the lot is surely Unified Strike, which lets you exile a creature for only one mana with the caveat that that creature’s power is less than the number of Soldiers you control. Not only is this exactly the sort of card you’d expect to see in a tribal set, but it’s fairly strong and a happy draw at any point in the game. Speaking of Boomerang effects, Blue pitches in here with a pair of cards that work similar tricks. Essence Fracture is a double-Unsummon that can be cycled away if you need something else. Dispersing Orb is an enchantment that can return any permanent to its owner’s hand, but it comes at a steep cost that prohibits abuse- four mana and the loss of a permanent of your own. Like Oblation, however, canny use of the card can set up game-winning situations from time to time. The final two cards here aren’t exactly removal in the traditional sense at all. A pair of Sandskins are good at taking one of your opponent’s creatures out of the fight, but like Gaseous Form and and Ghostly Possession, it still leaves your opponent in control of a blocker par excellence for the rest of the game. Like some of your other cards here, you do have the ption to use it on one of your own creatures for some benefit, but this is more of a desperation ove if you happen to get a stuttering start and find your opponent hammering down on you with big creatures- its much less efficient in terms of stopping power to stall against weenies or swarms. There’s also a helping of combat tricks to keep things in the red zone nice and unpredictable. Your opponent might get lulled into blocking your Gustcloaks with larger creatures because they can simply withdraw from combat, but this can set up a real surprise for the times when you choose not to remove them and instead pump them up for the kill. Inspirit not only gives you a hefty power and toughness boost, but untaps your creature to serve on defense. Defensive Maneuvers is another tribal-support spell that can give all of your Soldiers a massive jolt of toughness for a turn. Meanwhile, you have some reactive magic in the form of an Akroma’s Blessing to give your side protection, which can also be used aggressively against an opponent to get your creatures through for one final strike. Lastly, the aforementioned Sunfire Balm is a damage-prevention spell that has the updated cycling ability, granting a lesser bonus when cycled away. From there we find some of our Blue trickery cards. Mage’s Guile temporarily gives a creature shroud until end of turn at instant speed, which is just the thing for warding off targeted removal. It also cycles very inexpensively, giving it some welcome flexibility. Meddle– a reprint from Mirage- lets you change your opponent’s removal spell to target one of their own creatures, or steal a combat trick for one of your own. It’s narrow and conditional, but cards like this are always a lot of fun to spring on an opponent. 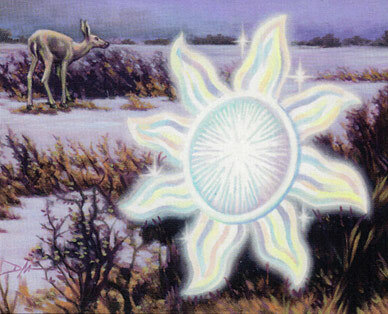 Blue also offers some tribal-based card drawing in the form of Airborne Aid. Half of your creatures are Birds (making this as much a Bird deck as a Soldier one, in essence), so you can often expect a reasonable return for your four mana. The last card here is the Piety Charm. This was the fourth time Wizards had released a cycle of Charms in a set, with the most recent being the Guild Charms in Return to Ravnica. Like the original Charms of Mirage and Visions, the Onslaught Charms are all one-mana spells (Planeshift, like the Shard Charms that would come some years later, went three-colour), and each reinforced the set’s tribal feel by boosting their respective tribe. Here, the Piety Charm can act as another combat trick for one of your Soldiers, destroy an aura (yawn), or give all of your creatures vigilance for a turn (narrow). Although that’s it for the deck’s creatures and spells, we are left with one last tribal gift in the form of a Seaside Haven in the land component. Although it only taps for colourless mana, it has a very nifty trick in that it can let you trade a Bird for a card for only two mana- just the thing for responding to any burn or removal, and a fine way to get use out of a creature that’s about to die. That’s all for now, we’ll be playing the deck in the field to see how the pieces come together, and will be back in two days with a summary! The Gustcloak mechanic seems really interesting, and allows a great degree of manipulation in the combat zone, especially if coupled with the abilities of some creatures. That being said, I would have reduced the number of combat tricks in the deck- they’re one of White’s trademarks, but the deck would have been much more robust and consistent with a decent removal suite. Finally, having only two morphing creatures in the deck( neither of them being “tricky”) feels like a missed opportunity- or a wrong inclusion. Blue-white flyers has always been a staple strategy of the game. Overall, the deck isn’t too innovative, except for the gustcloak mechanic and the tribal elements. I can’t help but feel that this is a boring deck to me personally, maybe it is because I started with onslaught block when I was first introduced to magic and I have always known these cards. Anyways the gustcloak mechanic looks very good on paper, I don’t remember how well it was back when I used it. As a more experienced player now, I feel like I could take more advantage of it. It allows the player on the offensive to be more reckless, like having a big attacker with lifelink in that way. White needs more swords-to-plowshares type of removal in this block, the conditional Unified Strike is as close as we get to that. As was mentioned before, morph seems like a misfit here with few bluffing capabilities. At least the deck construction seems alright, with plenty of fliers and synergy in the deck. The gustcloak mechanic doesn’t seem too much interesting, but a deck full of card with cycling means versatility. If my memory serves me well, there’s a knight in Time spiral with the gustcloak mechanic, i think it came in Crusader’s hope. To be honest, I don’t really like the idea of gustcloak… It’s not my style of playing. I think the deck would be fun to play though and it will be interesting to see how this plays out in the second half of the writeup. I was introduced to “gustcloak” through a single copy of Reconnaissance back when my intro to Magic was a handful of random cards and a precon. Of course I never drew it, seeing as it was a singleton in some 70-card deck, and I don’t really remember it working either. This is how seeing just 6 gustcloaks in this deck feels, even if one of them is a lord. And Sandskin is hilarious in just how it nerfs the whole point of gustcloaks. Well, sandskin as removal anyway. It’s definitely a combo with Ironfist Crusher.